As some aircraft designers continued to develop flying boats capable of trans-ocean flights, many others focused on providing seaplanes necessary for the war effort. The military searched for aircraft suitable for the many different climates and terrains that would need protection during the war as tensions increased prior to World War II. One of the most widely used aircraft in World War II, the Consolidated PBY Catalina flying boat served in every branch of the United States Armed Forces for anti-submarine warfare, patrol bombing, convoy escorts, air-sea rescue and cargo transportation. In fact, the last active military PBY planes remained in service until the 1980s, and many still actively participate in aerial firefighting today. The name “PBY” came from the 1922 U.S. Navy Aircraft Designation System. “PB” stood for “Patrol Bomber” and “Y” from the Navy code used for the plane’s manufacturer, Consolidated Aircraft. The PBY also served as a commercial aircraft and used by QANTAS, Cathay Pacific and Panair do Brazil airlines for flexible operations. In the early 1930s, the Short Brothers, who built Empire flying boats for Britain, found that the only way their seaplanes could attempt trans-Atlantic flights was by increasing fuel tank size. However, the increased tank size forced the airline to reduce passenger and cargo space. 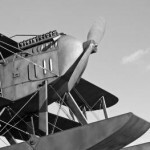 Major Robert H. May, who was the technical general manager at Imperial Airways—one of Short Brothers major customers—suggested mounting a small long-range flying boat on top of a larger carrier aircraft. The larger plane would bring the smaller plane to operational height, at which time the two planes would separate, the smaller plane going on to the destination and the larger plane returning to base. On July 21, 1938, the first Short Mayo Composite Aircraft, consisting of the larger “Maia” and the smaller “Mercury,” completed the first commercial nonstop East to West trans-Atlantic flight. Only one such flying boat was created before the outbreak of World War II; better development of in-flight refueling and the creation of longer-range Empire boats made the process obsolete. The “Maia” was destroyed by Germany in Poole Harbour on May 11, 1941, and the Mercury was broken up on August 9, 1941, so the aluminum could be used in the war effort. Imperial Airways, with a fleet of 26 British Empire flying boats, pioneered inflight refueling. This meant the planes were lighter at initial takeoff because they did not have to carry such large quantities of fuel, and inflight refueling also increased the range which these planes could fly. The planes were fitted with special equipment and extra fuel tanks and refueled in-flight by converted bombers, one of which operated out of Ireland and two out of Newfoundland. The Boeing 314 Clipper, produced by Boeing Airplane Company from 1938 until1941, was one of the largest aircraft of the time. The first flying boat, “Honolulu Clipper” entered service with Pan Am in January 1939, providing transportation between San Francisco and Hong Kong. A one-way trip on this flight took over six days to complete. A Boeing 314 known as the “Pacific Clipper” was en route to New Zealand from Honolulu when Pearl Harbor was bombed. Upon landing, rather than risk being shot down by Japanese fighters, the decision was made to fly the plane west to New York rather than return to Honolulu. The flying boat left New Zealand on December 8, 1941, covered over 8,500 miles and landed at Pan Am’s LaGuardia Field seaplane base on January 6, 1942. The Boeing 314 fleet entered military service during World War II, and flying boats were used extensively during the war. The Tasmen Empire Airways Limited (TEAL), which provided service initially from Auckland, New Zealand to Sydney, Australia, as well as the British Overseas Airways Corporation (BOAC), used Solent flying boats for regularly scheduled flights. BOAC used the flying boats for a Southhampton to Johannesburg, a trip that took four days with overnight stops and a route that travelled down the Nile and across East Africa. TEAL flew the planes between Sydney, Fiji and Auckland. With the outbreak of World War II, the military’s use of flying boats increased due to the lack of runways that could handle large planes and the ability of seaplanes to land on water when necessary. For more information on seaplanes, or to learn more about the engine repair services we can provide for your aircraft, call Covington Aircraft at 918-932-3993. You can also join us on LinkedIn and Twitter.